There has not been a day in the past weeks that has passed without a mention on CNBC or Bloomberg about the current health care proposals underway by the Obama administration. The bottom line issue: health insurance has become too expensive for Americans. It has become a hot button issue, one dividing strong political lines. Amidst the turmoil, top health insurance providers such as UnitedHealthcare Group (NYSE:UNH) and WellPoint, Inc (NYSE:WLP) have seemed to remain resilient throughout. Why the resilience? Most analysts would argue that the extremely high uncertainty around the health care debate is keeping these tickers stagnant. The uncertainty is rooted in that deep dividing line and will hopefully lead to a deeper understanding into why health insurance has become unaffordable for the 10% of Americans who cannot afford coverage. This has posited a nearly impossible situation for the health insurance providers, dubbed as “profiteers.” While hospital costs are not the full picture of what goes into health coverage, it is difficult to imagine a scenario where the cost of premiums could not have increased at a 6%+ rate each of the past ten years. Search data shows us the resilience of consumers despite these trying times, however. Comparing 3 main themes in the health insurance search arena, affordability reigns supreme among consumers, not the low cost options. This demand has been constant from the time that Google started reporting on searches in 2004. What jumps out from this chart is the staggering rise of the action-oriented keyword “apply” in the health insurance space. Consumers have had a constant demand for affordable health insurance, but over the past few years, they have been taking matters into their own hands to find the right ways to apply for health insurance. Affordability, the issue at hand for the Obama administration, will certainly be at the forefront of this debate. 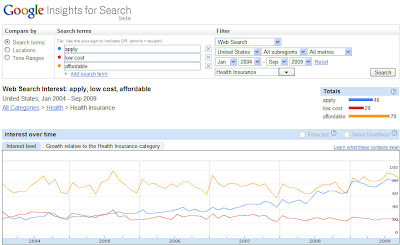 This search data, paired with the resilience of health insurer stock prices, indicates that the debate may not be a “helpless consumer.” Consumers are taking matters into their own hands to play off of the competitive nature of internet shopping to find their most affordable option. Rising operational expenses to health insurance providers causes compressed margins as expenses rise at a rate 2-3x the cost of inflation (CPI). UnitedHealth and WellPoint, among others, have a profitability obligation to shareholders which requires them to maintain their premiums at a trade-off between their rising opex and volume of customers. Consumers have increasingly turned to the internet to do comparison shopping, which naturally drives the price down to the market equilibrium of what providers can afford at an acceptable rate. Rather than focus on mandating a lower cost of health insurance, shouldn’t we attack the reasons why health insurance has become so expensive? The public debate has not yet shifted to this arena, but it appears that the equity market may already be taking this into account. Stocks like UnitedHealthcare and WellPoint will be the reflection of where we move toward in health care reform. At this point, they appear to indicate that we will either stay status quo or move in the private direction.